Writing about whatever comes to mind. Real Estate, Video, Etc. Countless hours spent trying to sort through nebulous and vague information, help files, help tutorials to simply get a new MacbookPro to connect to 802.11n via a Qwest / Centurylink Q1000. Here’s a tip, if you’re trying this too, this is the only place you’ll find what took me days to get worked out. It took 2 days of searching, including unanswered emails to manufacturer, and the typical can’t contact customer service issue with century link to find out how to get 802.11n working with iPhones and MacBookPro and our iPhones with a Q1000. Ya think they could have bothered to post this information somewhere? 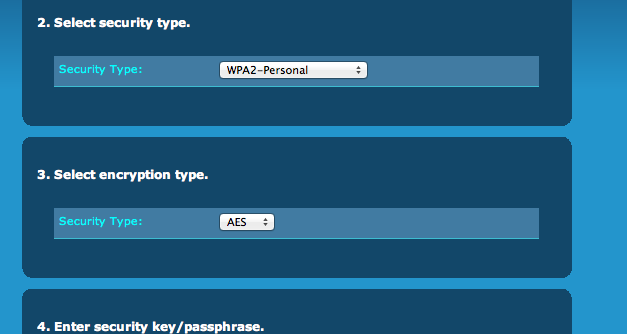 set the wireless router security to WPA2 Personal AES–as above under Wireless Security. or many other variations of the same. All that was wanted was to find someone, somewhere with some information about how they could connect their new macbookpro, iPhone or iPad to 802.11n. Alas, it must be that this was a problem that only the writer must have suffered, or was it that no one else could find the information either? So, in case you’re one of the people living in the shadows stuck on 802.11g having hardware that has and can connect to the faster 802.11n, and this page actually showed up in a google search, hope this helped. It can’t go without saying ,but the dumbing down of the children, the college degrees that document attendance instead of performance is showing up in the pathetic customer service we see from manufacturers throughout the land. You’d think, perhaps just one person might consider that Mac owners might want to connect to the expensive new modem/router they bought. Of course that might require actually thinking about us the customer instead of whatever the heck they’re thinking about. I learned my name was Riley years ago. Some called me BB, cutie and a few others. I was most happy however when I found out my last name was Riley Otumsnotums the 3rd. The best thing about learning my name was that it came with tons of history. I didn’t know it for awhile but according to my dad, I came from a long line of famous famous ancestors. I have a little trouble pronouncing my last name. It has too many letters but I know how it sounds. Some think that when they hear their last name its about getting in trouble. Not me! I know that I’m going to get something good when that happens. I had good career. I have little jobs I do in the neighborhood. I carry toys out to the park for my Dad to play with. See, dad has a certain disability, he can’t quite understand me sometimes and needs the exercise. I think he has a speech impediment also. See I’ll say things to him and I know he wants to communicate, but instead he makes sounds that I sort of recognize as language, but don’t really understand. My dad is something else. At night, he would tell me stories about my great uncle Riley Otumsnotums the 2nd who invented gravy. One of my favorites was the story of my great great great grandfather Riley Otumsnutums the Great who was the father of all of us Otumsnotums. Riley the great helped start a something called the United States of America by helping the very first president. Now, I know my dad might be making up some of this. He also probably exxagerates so I’ll feel important. Every night he tells me about one of my great relatives. Even if it isn’t all true, I listen anyway, I like his voice and how his face lights up when he’s saying something that I need to think is important. I have to look out for him so I stay on the bed to make sure he didn’t fall off, and to protect from burglars or other bad things. I have a great mom too. Her voice was like soft silk. She would sing songs to me that always made me feel good. Although, mom had this pesky habit of always cleaning my eyes looking at my teeth. I don’t really know what that was about, but I just let her do it because it seemed to make her feel good. I learned a few things too. I learned how the practice playing the piano on my dads arm. Af first It was odd, but, I found that the better I got at it, that little snacks would suddenly appear. I think I’m like anyone else. I like my parents, I love steak, bacon, eggs, a nice walk at sunset and just relaxing and enjoying family time. I’m better now, but for awhile there I had to go away to stay with some other people. I think it was a hotel, but with pretty good service. I’m sure my mom was calling in to make sure they checked my eyes and heart rate and what not. The food wasn’t all that great but, the people for the most part were real nice. My mom and dad would come and visit me every day. They really made over me, but , I wasn’t really felling all that good. Dad says I lost my appetite, but, I just wasn’t hungry. He brought me me some things from home so I’d feel better. It didn’t matter I was just happy to see them, but I wasn’t feeling so well. The nice people that were watching out for me had all sorts of sparkly things they’d show me. Some of them stung a little bit, but they’d smile and comfort me afterwards. Then one day, mom and dad they returned. I was taking a nap and one of the nice people came to get me. They said I could go home. Shucks, I was kinda getting used to everyone. I think I even had a girlfriend or two, or at least could have if I had stayed. Strange, they were happy for me to leave. Anyway, back home. What a thrill. I seemed to have more energy, and felt like I could run a mile. I missed eating mom and dads home cooking. Dad told me we’re gong to see grandma and grandpa. They’re old you know so it’s good to see them while we can. I love it down there. There’s always some activity to keep my interest. I also have other friends to play with down there. I don’t exactly know where it is and can’t pronounce the name, but its about a naps worth of time to get there, as long as my dad’s driving. If mom’s driving, all bets are off. After thanksgiving I started feeling a bit odd. I was tired and lethargic and my legs weren’t doing what they were. One day in the middle of the day, mom came home. I thought that unusual but I’m always happy to see her, but this day, I really wasn’t feeling so up to snuff. We hopped in the car and I was back at the hotel with those friendly people again. I felt bad for a few of them for they seemed quite worried and I would have done anything to make them feel better. I was thinking my dad could tell them about Riley Otumsnotums the 5th, who laid out train tracks across this great land. He and my mom were sad too. A couple of days went by, I think. The nice people brought me more shiney things to look at. This time they didn’t sting. I was there a lot longer than before, but my mom and dad seemed t always be around when I awoke. Now the bad part, I apparently wasn’t eating enough so I found myself with a tube through my nose and pumping food into my stomach. It didn’t last very long though. I guess my mom and dad got real sad about that then came and picked me up. The people at the hotel felt bad about my lousy stay so they made up for it and gave me a little going away present , a sweater with a big heart on it. I wasn’t mad at them, I just wasn’t feeling to good and was so happy to see my mom and dad. We went home, and I was pooped. I couldn’t stand up like I used to. Dad made me a plate of steak and little bits of bacon. I did what I could to eat a few to make him feel better, but I really wasn’t up to it. They made a fire in the fireplace and put me on a chair so I could watch it with them. Mom sang little songs to me and dad took some pictures. I think the air must have thickened up while I was gone. I found I had to breath more and more every minute. I tried to stand up,even take a little walk but I was exhausted. I fell down, my mom started crying, my dad did too. They picked me up and took me back inside. They had food and drink ready for me but I just wasn’t up to it. I just wanted to be held. My mom held me for hours. I remember that day well. Dad was crying, mom was crying and singing songs. Dad got on his phone and called someone and I heard my name. I figure he’s just gonna help make it better and he did. I really wasn’t feeling so hot, something was wrong, but dad and mom were gonna fix it. A couple of hours later, a nice lady showed up at our house. Her name was Dr. Anne. I was too tired to give her proper salutations so I stayed with my mom, the pain was really getting to me. A few minutes later, the pain went away. I was happy but my mom and dad were crying. The next thing I know, I’m running and jumping and feeling like a million bucks! I could see my mom and dad and the lady below, I was flying! I looked around and it was the most beautiful place imaginable. I tried to talk to my mom and dad, but they couldn’t here me so high up. Then a nice man came up to me and explained that I would be taken care of with all the steak, toys, cherrios and pupparoni’s I could handle until my mom and dad got here. He said it’ll only feel like a little nap and I can be with my mom and dad again and that I should practice on my tricks. He even showed me a few more! I looked around and all my relatives my dad told me about every night were right here with me! I found out though that dad made up a whole lot of the stories, but that’s okay, I loved him and my mom more than anything and can’t wait to go play with them in the park up here. And that is what I believe my little best buddy would say if he could. 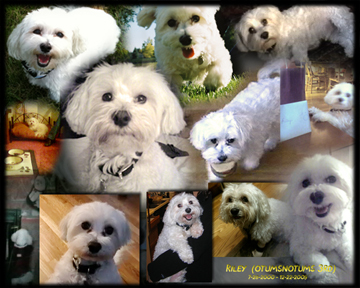 His name was Riley Otumsnotums the 3rd, he passed away on December 22nd 2009 and is missed by all who met him. Riley Otumsnotums the 3rd was my best friend, my little canine buddy who passed away from liver failure and diabetes two days before Christmas in 2009. He will always be in my heart and my wife’s heart and is missed by many. My dad taught me to forgive, my dog taught me how to love.